Resin bound surfacing for driveways, parks, schools and more is not your only option, NatraTex Cotswold and NatraTex Colour by the Bituchem Group boasts two alternatives to the traditional bound aggregates. It can be widely adapted to suit your needs and is great value too. Natratex is made by mixing naturally occurring coloured aggregate with a clear binder to make a fully synthetic bound surface. NatraTex Colour follows essentially the same process but a pigment is added into the aggregate mix to create specific shades to surpass any other resin bound surfaces. They can be used in areas that require a certain type of demarcation. Both our substitutes to resin bound products are laid in the same way as an ordinary blacktop, and they deliver highly versatile and durable finishes . Natratex products are of the highest quality surfacing and are created specifically to withstand natural wear and tear that may occur from high footfall, the weather, or consistent vehicle traffic. It’s extremely easy to lay and its qualities make it a highly attractive option to replace resin bound aggregate for your domestic, business, industrial or other choice of surfacing. Our range of NatraTex Colour surfaces are all clear bound and can be designed to meet your specific needs, whether it’s a playground surface, a domestic driveway or a business car park, we can cater for your needs. 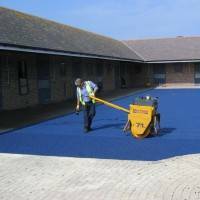 We believe this superior coloured surfacing offers a fantastic replacement for resin bound and is ideal for surfaces which require an aesthetic demarcation; the vibrant range of colours and shades we can produce are perfect for places like school playgrounds and parks, as well as bus lanes and bike lanes. Both Natratex Cotswold and NatraTex Colour have outstanding durability, are conveniently free from the need for maintenance, and are second-to-none in their appearance. If you’re considering a resin bound surface, think again – no matter what the specifications – these products are guaranteed to please. If you would like to learn more about a different option to resin bound products, check out the full range. Bituchem can recommend the best surfacing to your specifications, altering the depth dependant on expected footfall or durability requirements. We can also combine different colours in one project, which can work well if some areas are restricted. Don’t hesitate to contact us for any additional information or a quote, our highly qualified staff would be happy to help!